with plenty of roads that carry very little traffic. 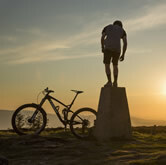 Ample forest tracks provide casual off road routes for beginners and for the more adventurous, the forests and hills in the Borders provide some of the best mountain biking in the country. These include 7stanes at Newcastleton and Glentress. The Borders are ideal in so many ways for the avid cyclist. whether its fast downhill stretches, rough country lanes, or hard hilly terain, most routes will show you beautiful views all the way, over some of the loveliest countyside as a reward. There are many well known and established cycle routes in the Borders. You can find booklets and leaflets describing the Tweed Cycleway, The Four Abbeys Cycle Route, and Borderloop at most Tourist Information Centres. also produces free leaflets covering routes around the larger Border towns.